Summary: Mote Marine Laboratory will continue a collaborative project between Mote Marine Laboratory, Fish and Wildlife Research Institute, and the University of Illinois to investigate the extent that brevetoxin intoxication may cause morbidity and mortality in stranded sea turtles along the central west coast of Florida. Brevetoxin levels in tissues and body fluids from stranded sea turtles during red tide events and in the absence of red tide will be determined. Control tissues from presumptively unexposed dead stranded animals from the east coast of Florida will be obtained. 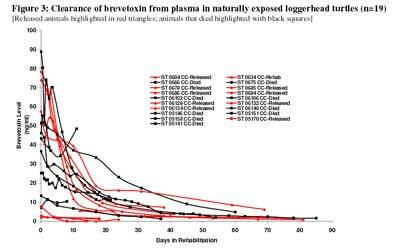 The spectrum of gross and histologic lesions that may be associated with the presence of brevetoxin in tissues from stranded sea turtles will be investigated. Lastly, we will investigate any correlations between brevetoxin levels in dead animals and Karenia brevis cell counts along with the covariates of season, stranding location, gender, species, reproductive condition, and body condition.